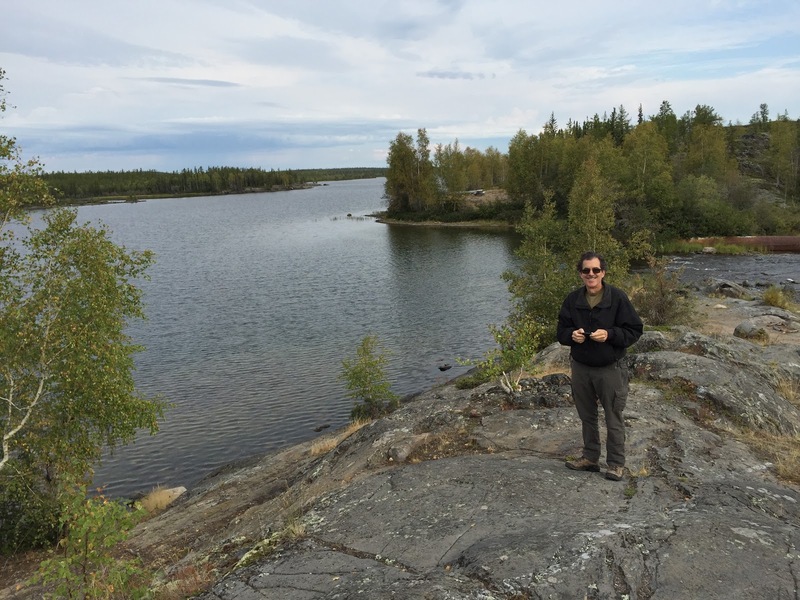 Seeking True North, Day 9: Yellowknife, NWT. 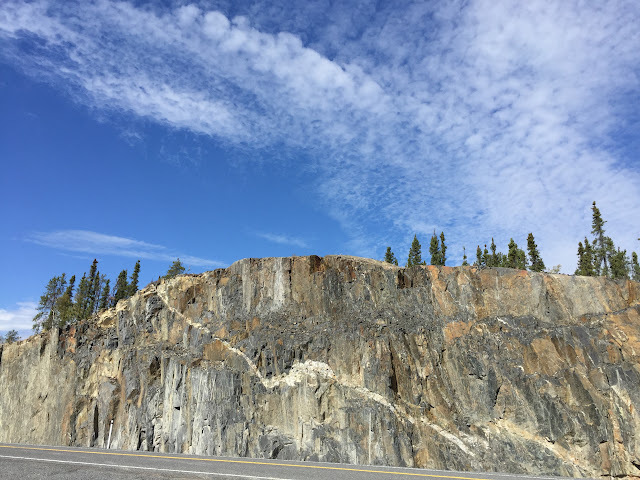 Having checked out most of the summer sights in Yellowknife, today we set off to drive the Ingraham Trail, the only road extending east and north from town. 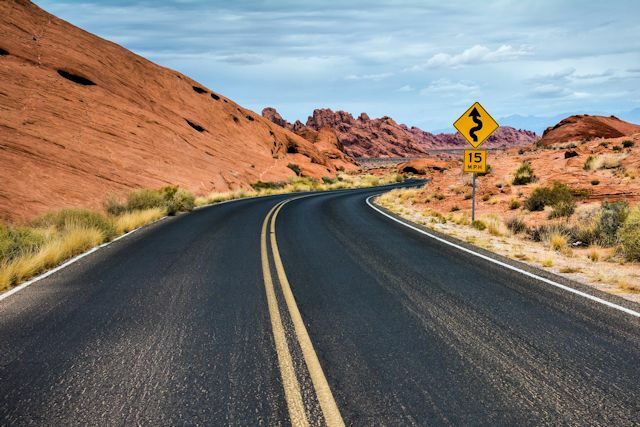 Envisioned as just the first leg of an ambitious project to construct an overland route to the Arctic, the 43-mile highway was built in the mid-1960s. To date, it is the only section of the planned interior route which has been completed. 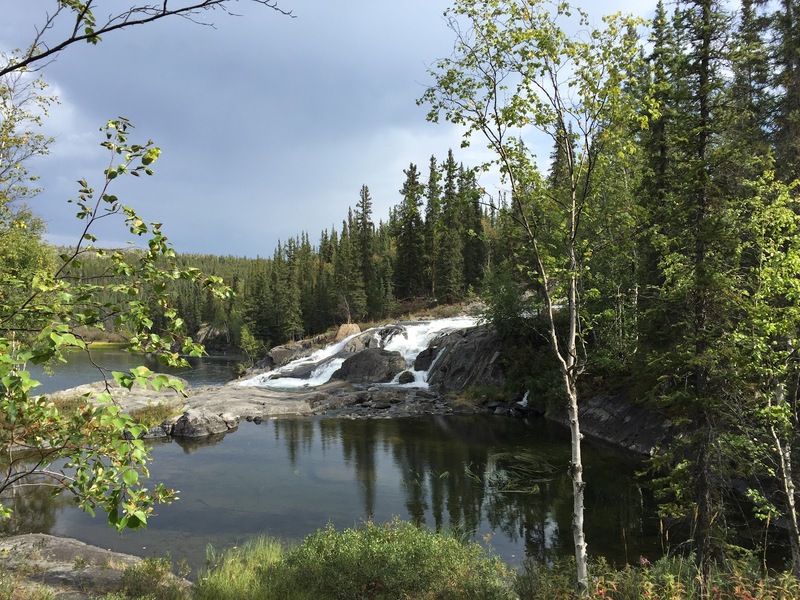 Today the Ingraham Trail, named for an early Yellowknife businessman, carries recreational traffic and provides summer access to remote residences and the small indigenous community of Dettah (pop. 240) on the opposite shore of Yellowknife Bay. 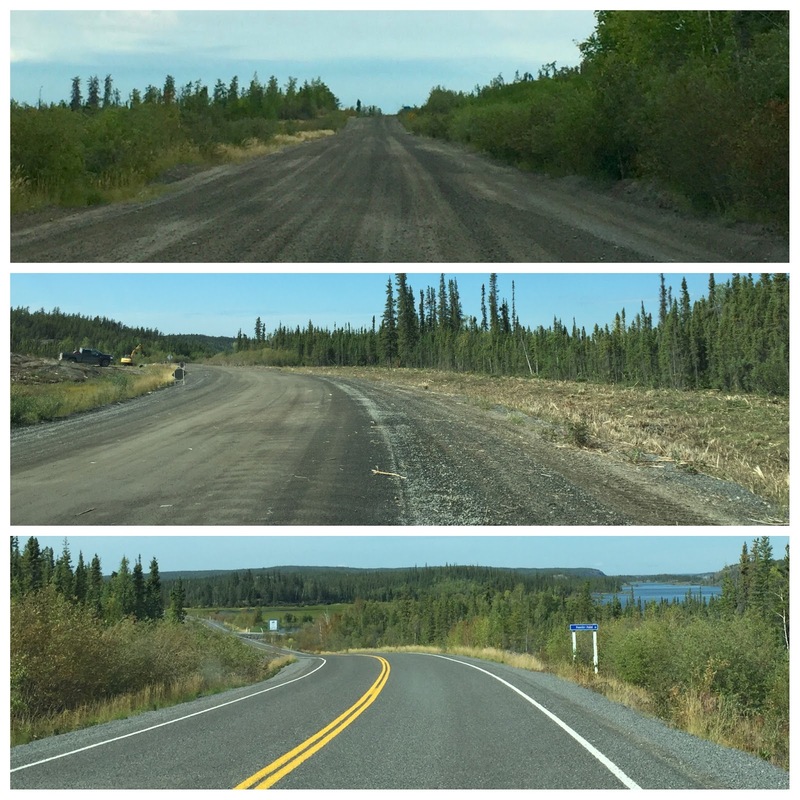 Frequently transitioning from asphalt to chip seal to gravel and back, the road winds through mounds of bedrock adorned with groves of birch and spruce. Small glacial lakes are abundant. In fact, it was one of these that helped us locate the spot where we went aurora watching with Sean on Monday night. 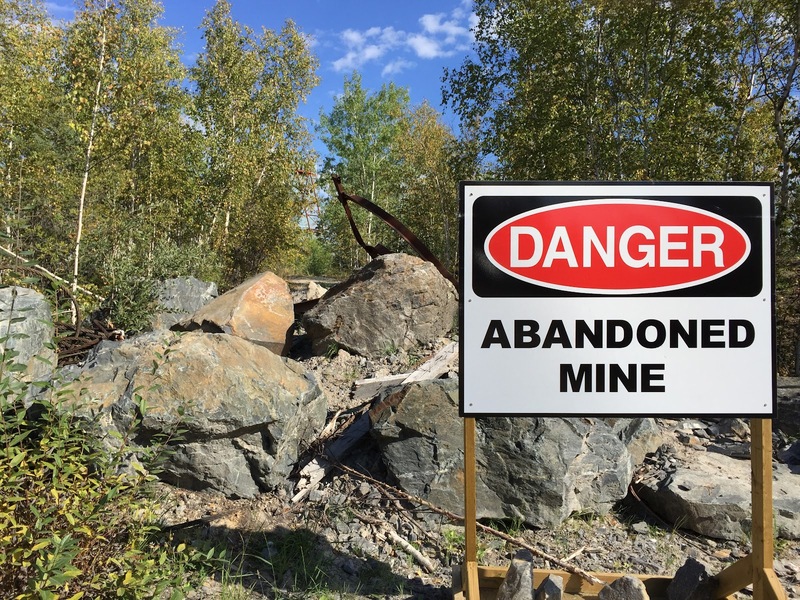 Along the way, we passed the abandoned Ptarmigan gold mine. Signs warned of danger and contamination. Unfortunately, the release of large quantities of arsenic is a by-product of mining operations. 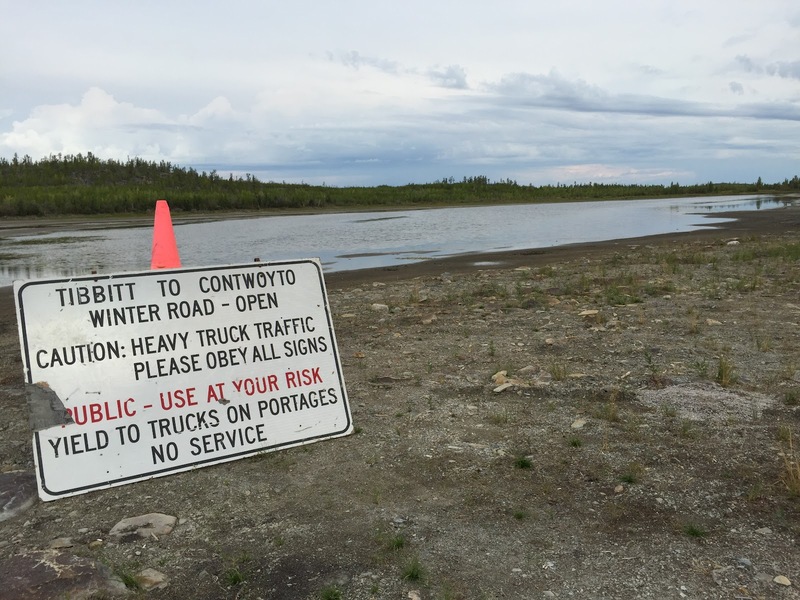 Local mines' arsenic contamination went unchecked until 1951 when a child from the Yellowknives Dene community died of poisoning after eating snow in the area. Unfortunately, the solution was to bury the lethal waste underground. With the help of the federal government, the NWT is trying to devise a solution to protect the people of the area from this subterranean toxicity going forward. 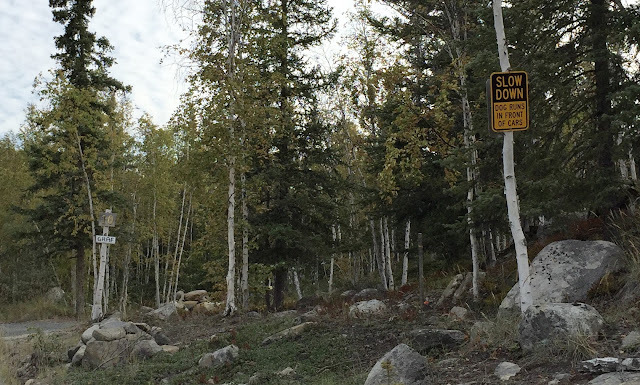 About midway to the end, we came across areas damaged by a forest fire along the Trail in July. 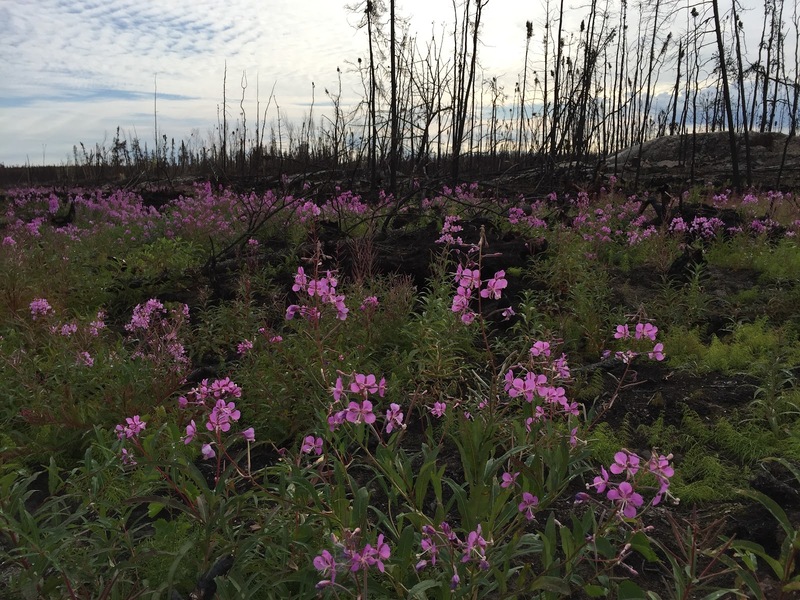 Being the opportunist that it is, fireweed had sprung up and quickly colonized on the vacant area now that it has open access to the abundant sun it needs to grow. The contrast of the brilliant magenta blossoms and red stems against the black char provide the stage it needs to shine. 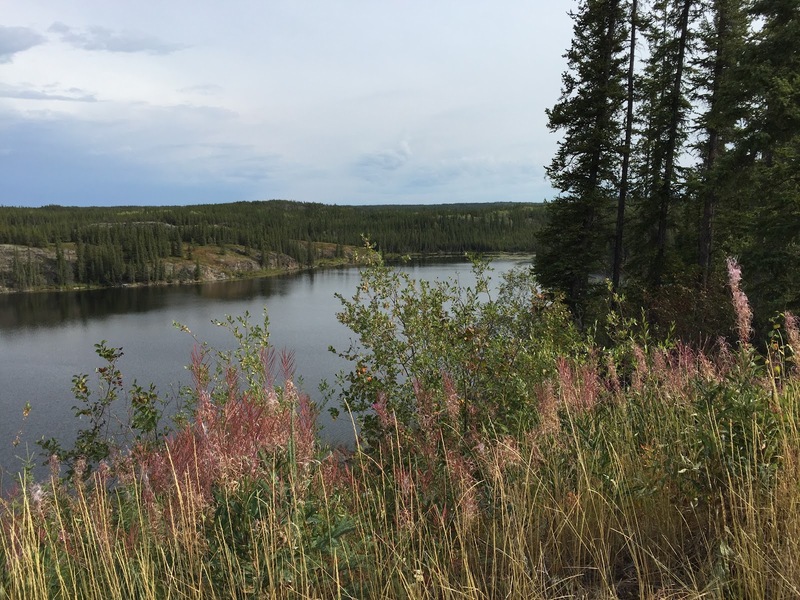 When brush grows back up, the fireweed will die back from lack of light, leaving behind seeds to germinate when the land opens up again years later. Fireweed brightens up a dark chapter. 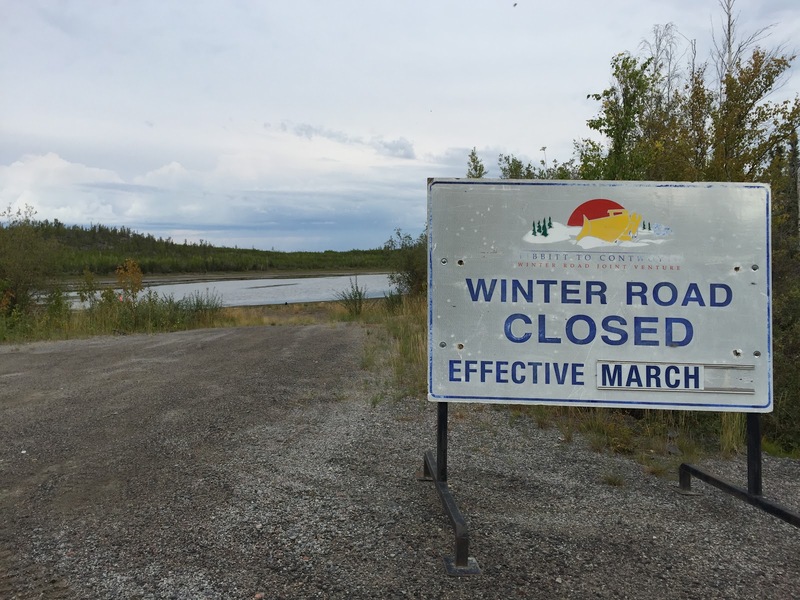 Signs helped us identify where the ice road north intersects Ingraham Trail in winter. Accustomed to seeing (CLOSED IN WINTER) labels on maps, we began to look around for Alice and the Mad Hatter when we first saw (CLOSED IN SUMMER) marked on an NWT map. Yes, the ice road will run straight across that lake in about five months. Though we had heard that a stop sign announced the terminus of the Ingraham Trail, we found only a cul de sac loop where the road ended at Tibbitt Lake. 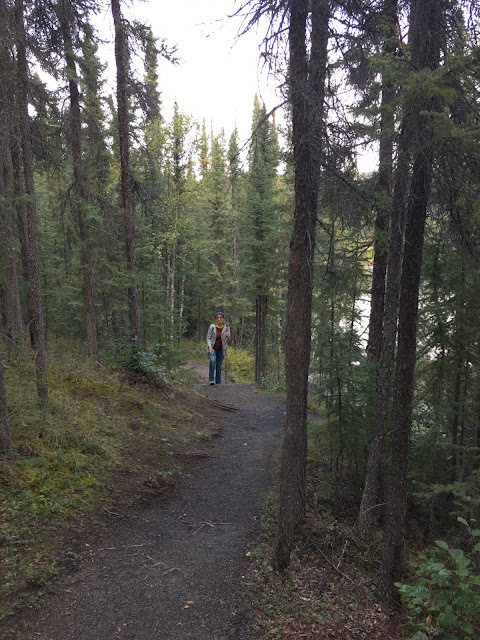 We took a few photos at the lake and headed back from whence we had come. We had missed the sign for the trail to Cameron Falls on the way out and wanted to stop there on the way back to Yellowknife. 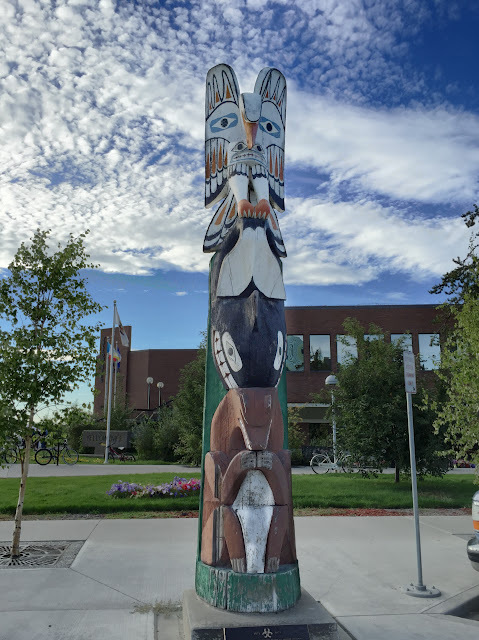 Several people we had talked to in town recommended it as a site worth visiting. Watching a bit more closely as we retraced our tracks, we saw the sign for Cameron River Ramparts. Though we weren't familiar with the use of the word ramparts to mean waterfall, it seemed to be in about the right place, so we parked at the trailhead and took off. 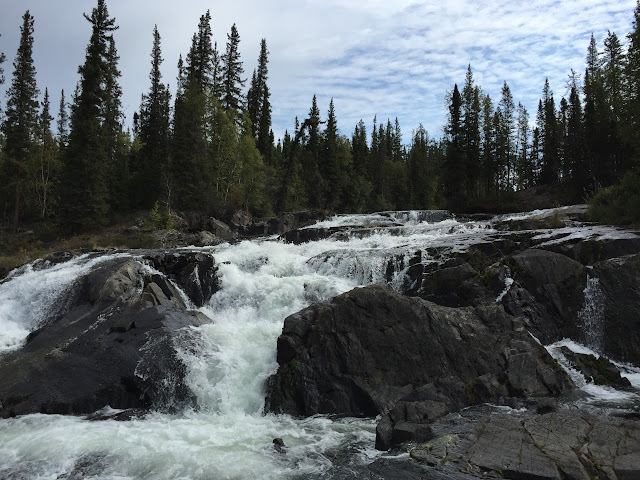 Sure enough, at the end of an easy well-marked trail we were rewarded with a view of a rushing cascade of water falling over a 20-ft ledge. It seemed the perfect place to plant a letterbox, so we did. As we were assembling the letterbox from components we carry, a pop-up shower began raining on our parade. This time we were better prepared than our little trek in Whitehorse last week. 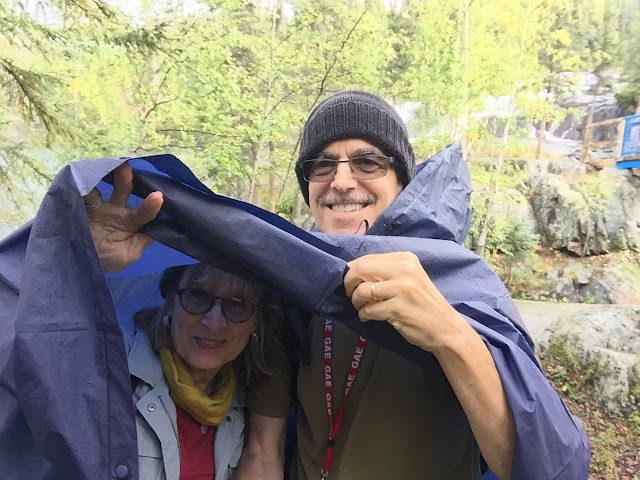 Ken pulled out a rain poncho and we suddenly had a makeshift tent to keep us and the letterbox dry until the draining cloud passed over. This is what prepared looks like. 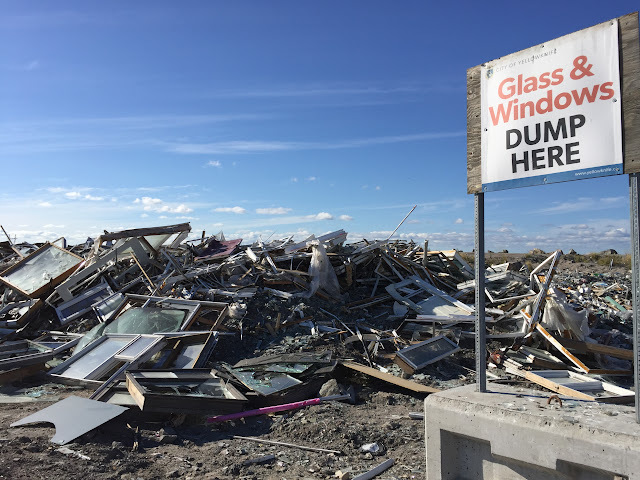 Following a suggestion from a local tourist guidebook, we decided to check out the town dump when we got back to Yellowknife. Yes, the town dump. The agent at the entrance wasn't the least bit surprised that we thought the place was a tourist attraction On the contrary, he apologized for being out of maps. Yes, maps of the dump. 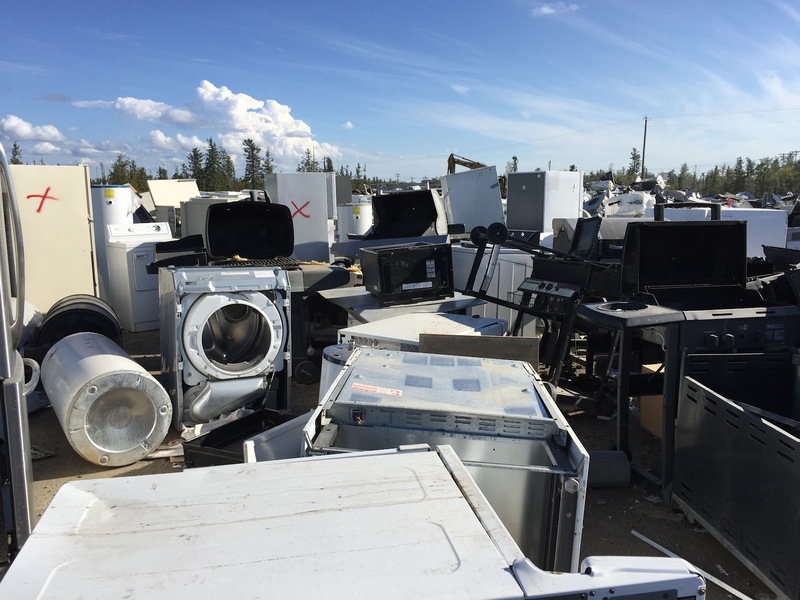 Apparently Yellowknifers have long been resourceful salvagers, and the town's solid waste yard is designed to facilitate their efforts. The expansive dump is divided into separate areas, labeled for different kinds of refuse. Roads are clearly marked throughout, even including stop signs. We heard more than one story about people building entire houses from salvaged materials, not to mention a multitude of repairs made with scavenged parts. Before returning to the hotel, we planted another letterbox near the Ledge, our third in the territory. Tomorrow we'll leave Yellowknife and fly to Ottawa en route to Iqaluit in Nunavut. We feel a little sad to leave this friendly town. So many of the people we've met here are transplants—mostly from other parts of Canada. 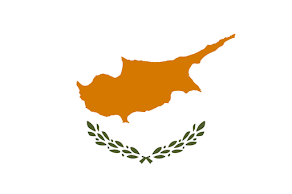 To a person, all seem to love it here, despite the brutal winter weather. Perhaps because of the convivial atmosphere, the so-called six degrees of separation seem to be reduced here to one—two at the most. Everyone seems to know everyone else—and likes them! We really may return in March.